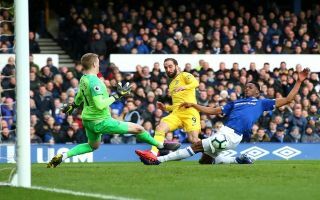 Chelsea’s first-half performance against Everton was very much more of the same – for all the wrong reasons, once again the Blues have failed to make their dominance count. The Blues did look as though they were playing with more intensity across the pitch than they showed in last weekend’s draw with Wolves, Sarri’s men fashioned several chances but failed to hit the back of the net. The best chances of the half came in the opening stages of the game, Eden Hazard dazzled Everton’s defence and had a shot parried away by Jordan Pickford and had one chance rattle off the post. Forward Gonzalo Higuain also had a chance cleared off the line in the opening ten minutes. Pedro was lively for the Blues in the latter stages of the first-half, after a magnificent solo run the Spaniard’s shot rolled past the post, just minutes later Pedro had the ball in the back of the net but the goal was ruled out for offside. Chelsea will be hoping to create the same amount of chances in the second-half, but they really need to be extra clinical in order to avoid today’s clash ending up like last week’s against Wolves. On too many occasions this season Chelsea have been made to rue their missed chances and wasted possession. – Solid first-half from the team overall. Dominated even. – But our (lack of) finishing and movement in/around the box is painful. – Barkley/Jorginho have been good so far. – Pedro is hit and miss. – Wouldn’t say no to Giroud coming on at HT. Chelsea players are holding the ball too much in the middle without looking for their striker in the person of @GonzaloHiguain in the game!! -Higuain poor, should have scored. -Barkley and Hazard best players on the pitch. -Jorginho‘ passes have been superb. We are gonna win the ‘Most Ball Possession’ trophy ?? Sarri a.k.a “Mr Possesion football” without results …is the most arrogant coach same team..same tactics …same players….tortoise pace build ups.. no scoring..another draw in waiting…Chelsea needs a coach who knows the ryt personnel to play at their rightful positions???? Possession without penetration = Nothing. Someone please tell Sarri ???? Doing the same thing again and again but expecting different results = Insanity. Poor! Poor!! Poor!!! This style of play wont get us anywhere. Azpi should cross the ball when he gets in a decent right position- for Higuain to use his head, but I forgot we have a stubborn Sarri and his trophyless style of play! The Blues have a massive second-half ahead of them.